but for now lets get to something fun! ohhhh the pretties over there! what sweet gifts they would make! who doesn't need a little sparkle and shine! 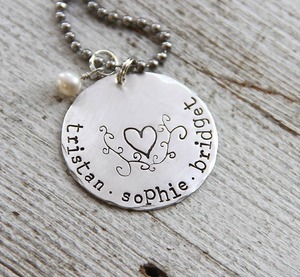 that you can add to a necklace as well as anything personalized. I think I am ready to order a couple- what about you? 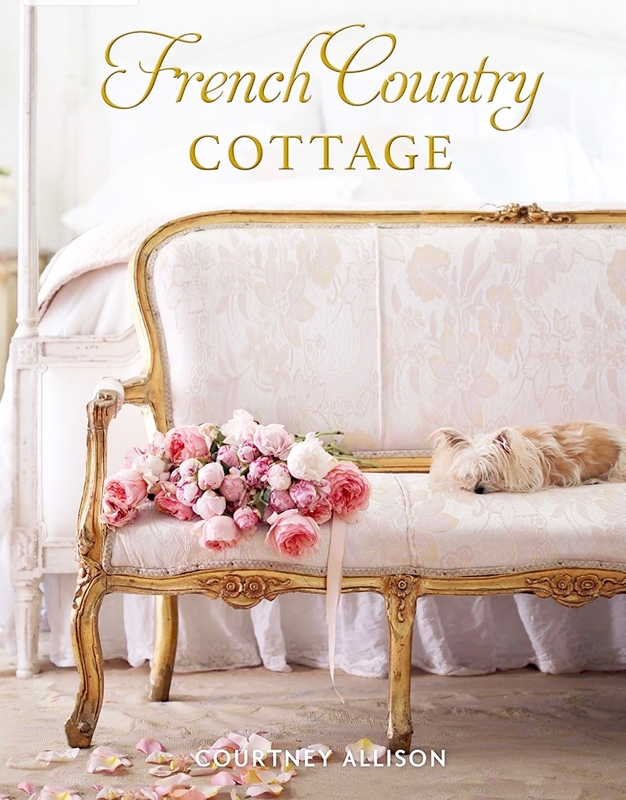 The Rusted Chain is offering a $50 gift card to one of French Country Cottage's readers!! Leave a comment telling me what you might order if you win. and leave me a separate comment telling me. liked 'em on fb and visited their site - would love to have the short message cuff with "this too shall pass" on it. thanks for the opportunity. Would love to win and get one for myself and my daughter. I liked the rusted chain on face book. I love the sparkle and shine pendent. I like the "I have all I need" necklace and the Charlotte earrings! 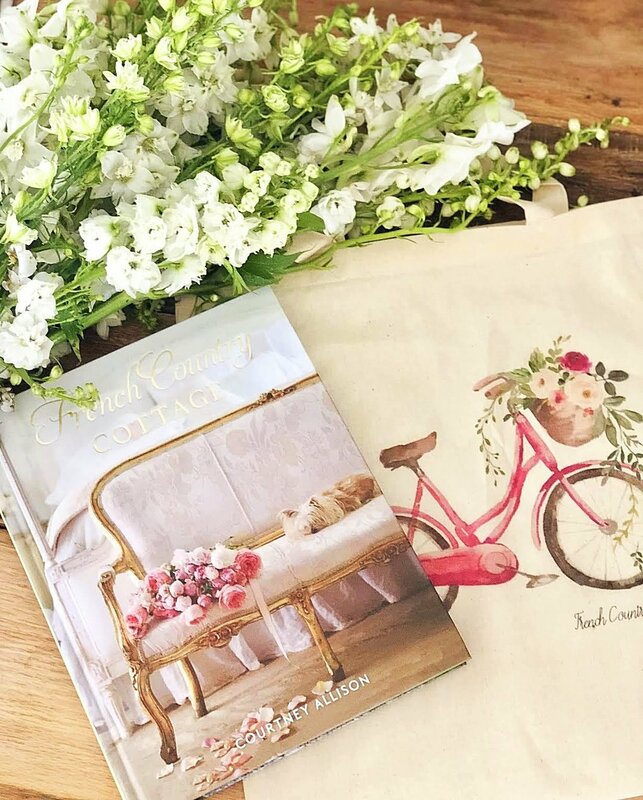 Lovely giveaway just in time for Mother's Day, Courtney! Thanks for a great giveaway.. I love the love grows here necklace.. So glad to have had you share their site. Thanks! Blogged this great giveaway also! Thanks again. Liked on FB... Off to troll the site to window shop! oh. WOW. So I saw so many beautiful things. The ones that struck me most were the butterfly necklaces - one said "Miracles happen" and the other said "Dream Big" - you have no idea. My daughter was born with congenital heart disease and it was thought she wouldn't make it. She turns 20 on the 16th and graduates from her conservatory acting program on the 18th. I've never been a prouder mom. Her totem animal is the butterfly. pinned to pinterest as well..
How cool. I just bought a metal stamp set so I can do this very technique to go with my domino and scrabble jewelry. What a lovely giveaway. I would choose the "Oh How He Loves Us" necklace. 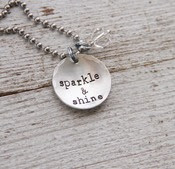 I like the sparkle & shine and the leap.fly.soar necklaces! Thanks so much for doing the giveaway and the opportunity to win! My personal fav was the "Believe" Necklace, I love how she added a pearl ~ one of my favs with my favorite saying! These pieces are beautiful and the teeny hearts caught my eye. Thanks for a chance to win this very lovely giveaway. I love the Charlotte earrings. I follow The Rusted chain on FB. I would get the word of the year necklace.. my word for the year is BELIEVE! Like on facebook. Stephanie H Olmsted. Wow, just choosing a favorite is hard. But it would have to be Love Grows Here with my kids names. My Mom passed away last August, so I suppose the "gift" would be for me, but honoring her by honoring my kids too! Does that make sense. 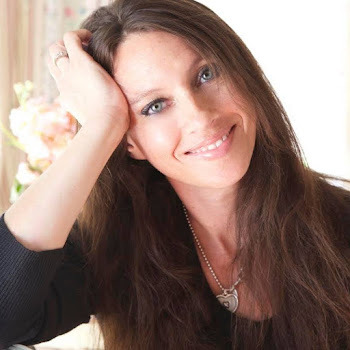 Hi Courtney, I have made a blog post today about the Rusted Chain Giveaway http://creat-w-kat.com/?p=418. I also tweeted my post and posted on Facebook too! Would love the " capture life" lovely!! Great giveaway Courtney! I would love the square monogrammed necklace. I love the "Deeply Rooted" items! Thanks for this chance to win! Adding this to my give away list on my blog! I too follow them on FB. And I'd love to get the Leap, Fly, Soar for my 22 yo daughter who is going off to Thailand on adventure this month! Travel is in her blood! So cute - hard to pick one out! 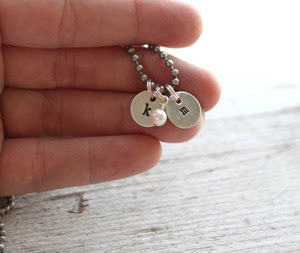 I think I'd like one of the "My Favorite Verse" necklaces with Psa 127:3 and the teeny tags with my kids' initials. And I like The Rusted Chain on FB! I have to say I love the extra teeny hearts! Thank you for the awesome giveaway! I really love the Two Tabs necklace! Love the capture life necklace! Liked the Rusted Chain on FB! Hard to choose! I would love to get my daughter the Capture Life necklace and myself the Teeny Hearts necklace with me and my husband intials on them. Biki's jewelry is so beautiful in such a simplified way. If I were to win, I would want the salt-water pearl drop earrings...Oh, but it is so hard to choose...Maybe the "S" pendant for my daughter, Shannon. Hi! I like the Anna earrings and the little initialed charms. Would love a couple with my childrens initials. I also liked The Rusted Chain on facebook! Nice giveaway! Super cute stuff and great giveaway! I would choose the Sparkle and Shine necklace as my elementary students always notice my jewelry and "sparkle and shine" is a good message to pass on to them! I also like the square monogram necklace! Cute stuff! Love the "sparkle and shine" so much. Perfect for my grand-daughter's birthday! Ooh, so hard to decide, but I think I'd go with either 'oh how he loves us' and/or the Two Tabs necklace with my beloved's and my names. I've Liked The Rusted Chain on FB :-) and shared the giveaway there as well. My sister saw one of these stamped necklaces in a shop but when I went back to buy it for her it was gone. She is the greatest sister ever and if I win I will choose the necklace with a verse. The one she liked said "My Beloved" Song of Solomon (SOS) 6:3. Thank you for the lovely giveawy. A gift certificate to purchase jewery from Rustic Chain. I had fun shopping and dreaming. The two I liked were the teen- tiny necklace and the necklace that had sister written on it. Thank you . I am enjoying your blog, very nice! Hugs and kisses necklace for sure. I love your blog! I really love the "words to live by" necklace at Rusted Chain. Fingers crossed!! I'd love the dream big for my daughter! I would absolutely adore the Love Grows Here necklace with the names of my husband and twin boys on - would love to have them close to my heart each and every day! Thanks for the opportunity - a great giveaway! Great giveaway! I would get the Audrey earrings. I Like the Rusted Chain on Facebook. Great blog + great store + great give away = bliss! It's very hard to pick, I also like the "leap, fly, soar", "hugs n kisses" is adorable, "blessed" is good too, but as it is soon Mother's Day and I have 5 children, think I would go with "mother". 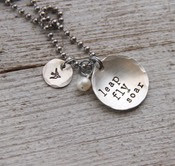 Love the Leap Fly Soar necklace. I have liked them on Facebbok and posted a comment on their wall. I really like the Rainbow Candy earrings--you can wear them with anything. Just liked The Rusted Chain on facebook. Love the pink earrings ! I'm totally digging the life is sweet necklace!! My favorite is the "Oh How He Loves Us" necklace. We all need a reminder, don't we? Liked The Rusty Chain on fb. Thank you for the giveaway. Leap Fly Soar is my favorite, but they are all so beautiful! Great giveaway, thanks for the opportunity! I liked them on FB as well, thx! I love the square monogram necklace? Hi Courtney ~ I really like the Proverbs 3:5 necklace My Favorite Verse Necklace. I would definately pick that one. What a neat gift idea and thanks for the opportunity to win. 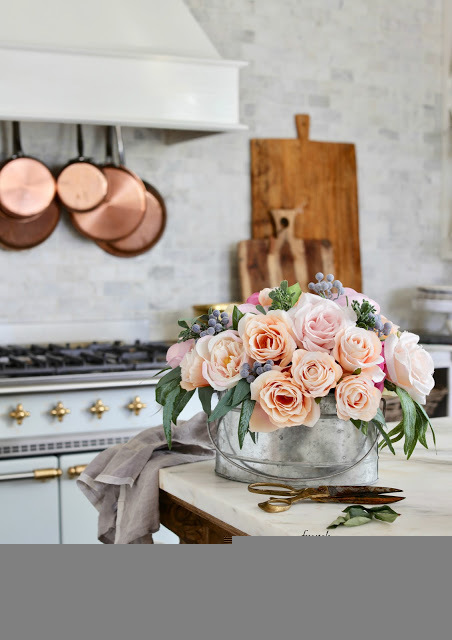 I just found your blog and it is really inspiring and your lilac photos are beautiful. I also liked The Rusted Chain on facebook and said "HI"
I'm with you! The cuff bracelets are fabulous! I really like the cuff bracelets ~ but the tiny initial hearts are pretty cute! Love Leap, Fly, Soar! Great giveaway! Like The Rusted Chain on FB! I'll go with the tine initial hearts! !